How to Get from Lisbon Airport to Peniche? If you are planning on travel to Peniche soon you will most likely arrive at Lisbon Airport. Once there, unless you have relatives or friends in the area you will certainly need a transport to Peniche. To avoid all the hassle of catching an Lisbon public bus or train to Peniche carrying your luggage back and forth and if you are not willing to wait in lines and for a regular taxi paying expensive fares to Peniche, your best option is to use our services and book online a private Lisbon Airport transfers to Peniche. Select Peniche as your transfer destination area and provide us with flight details, Peniche accommodation address and contact. We automatically process your request for transport availability to Peniche and send a booking voucher with your transfer confirmation in a matter of seconds. At Lisbon Airport arrivals terminal a friendly driver will be waiting for you next to a placard with our website logo. For the return transfer we will pick you up from the same address in Peniche. And remember, you can always pay later to the driver for both your arrival and return Peniche transfer. How far is Peniche from Lisbon Airport? How much will it cost? How long? The travel distance between Lisbon Airport and Peniche is 100Km and transfer time takes approximatly 70mins under normal traffic conditions. We offer the best private Lisbon airport transfers till your destination. Our direct Lisbon taxi transfers to Peniche have fixed prices and are the faster, affordable and mind free alternative of ground transportation to Peniche. At the Lisbon airport arrivals hall a well identified driver will meet you and help with your luggage and guide you to your assigned airport transfer vehicle, which may vary from an executive or estate car for up to 4 passengers, a modern people carrier van or mini-bus up to 16 passengers or a large bus up to 27 passengers. We will drive you there in about 70 minutes, directly. Welcome to Portugal! Peniche is a traditionally fish town in Portugal, the best Portuguese fish comes from Peniche. The town has nearby sandy beaches and great sports for surfing. 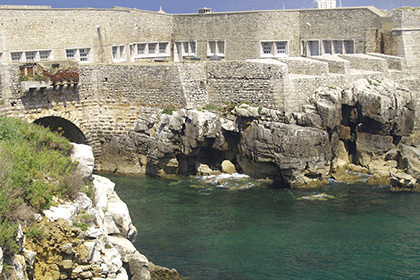 There are tremendous historical monuments like the baroque Misericordia Church, the Peniche fortress, among others. From the Carvoeiro cape you can see the Berlengas islands, they are declared as natural reserve. You can visit the islands by ferry and stay overnight at the camping park. Do not miss also the São João da Batista fort. Our private transfer service at Lisbon Airport will transport you directly to and from any resort, hotel or private holiday villas / apartments in the Peniche area. To pre-book taxi transfers from Lisbon Airport to Peniche or to other near by destinations take a look at our full list of taxi transfers fares & prices for all the covered locations in Portugal.